For years the Berlingo Multispace has been a bit of a secret amongst car buyers. If you are looking for a value for money car that is cheap to insure and run and don’t have any pretentions over what you drive the Berlingo offers a cheap, practical option. When you add the Family Pack to this offering for just £900 you get the same package in a seven seater. This option is only available on the VTR 1.6HDi 90 model so you are somewhat limited in the series and engine you can choose from. However don’t let this put you off as it is the mid range trim and engine and can be customized with many additional options. This is a very practical car. There is a tremendous amount of interior space and the thing about the boot on the berlingo is that there is plenty of height as well as depth which comes from the fact that the design for this car started life as a van. With all rear seats folded down there is a massive 3000 litres of space floor to ceiling. 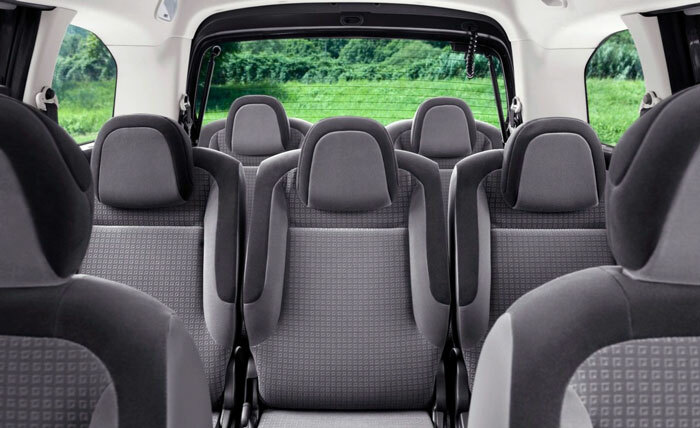 To put this into context consider one of the most popular seven seat MPVs: the Ford S-Max which has a highly respectable 2000 litres of load space. If you want to transport large items that is no problem. The large boot and low load height of the car make getting large or heavy items in the car a breeze. The second and third row seats all fold down and can even be removed. However when folded they don’t create the same flat floor that is evident on a lot of newer seven seaters. 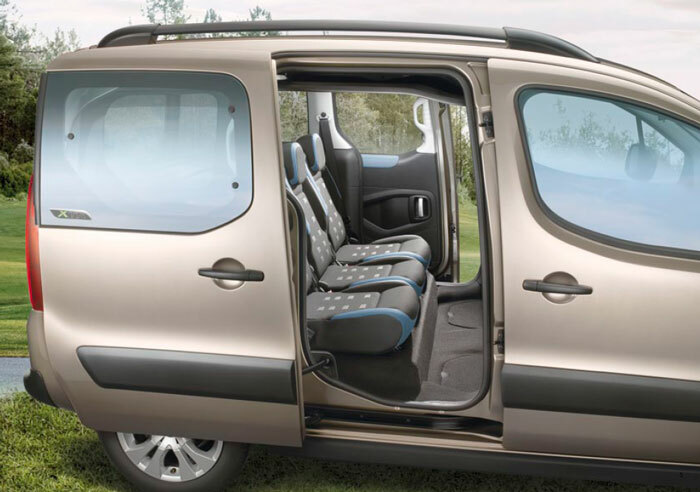 The large sliding rear doors make this car perfect for getting the kids out of the car when in tight parking spaces. 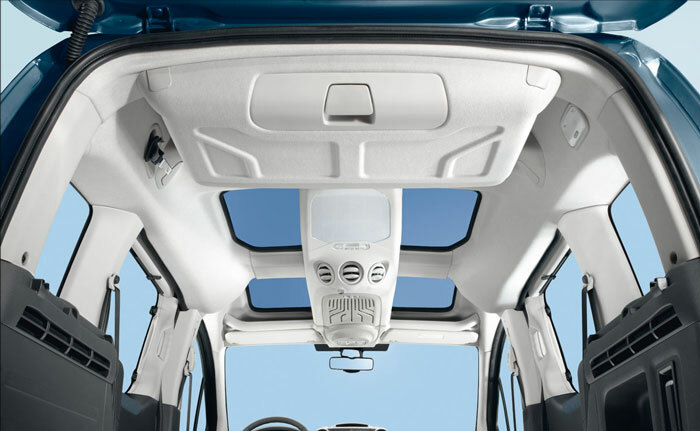 And when travelling in the Berlingo there is plenty of storage space for all your families needs including floor boxes in the rear, a large glove box and another for the driver and if you add the optional MODUTOP rooflights you get integrated storage almost like the overhead locker on an airplane. As standard you get ABS braking, Emergency Braking Assistance and Traction Control. There are airbags for the driver and passenger and front side airbags but not for second or third row passengers as standard. However the Safety Plus Package available on the VTR series adds curtain airbags which extend to the second row. The two outer rear seats have ISOfix fittings for child car seats. 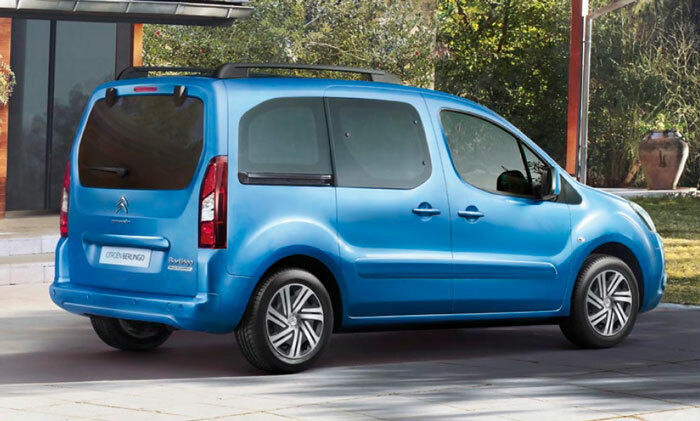 The Berlingo received four stars for both Adult and Child occupants in the Euro NCAP test performed in 2008. For Seven Seater car buyers there is only one model on offer that has the optional Family Pack available and that is the VTR 1.6HDi 90. This is a 90bhp 1.6 diesel engine that has a top speed of 101 miles per hour and a 0-62mph time of 15.1 seconds. Whilst that might not sound much it has a lot of pulling power and performs reasonably well in most traffic conditions. It is also quite frugal, returning 51.4 miles per gallon combined. 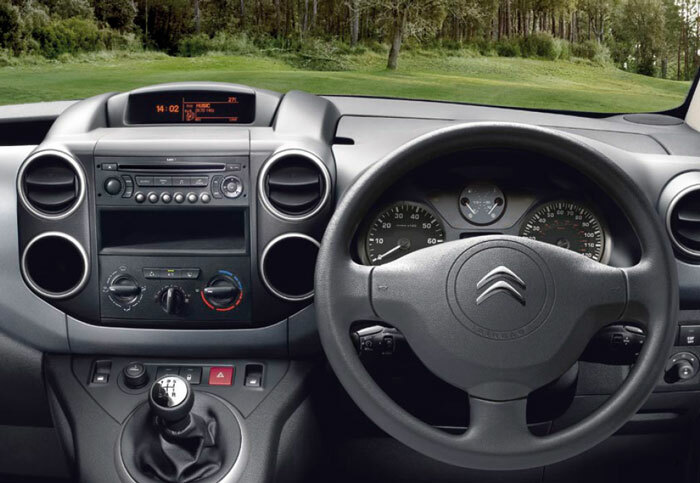 Sit in the drivers seat and you will see that Citroen have done a good job of upgrading what started life as a van into a reasonably comfortable driving position. The steering wheel is fully adjustable for height and reach. The drivers seat is height adjustable. There are front electric windows and add the Detection pack to gain cruise control. Unsurprisingly there is some body roll when taking on twisty roads but to be fair to the Berlingo the driving is quite direct and it is certainly an easy drive with great visibility from all the glass. 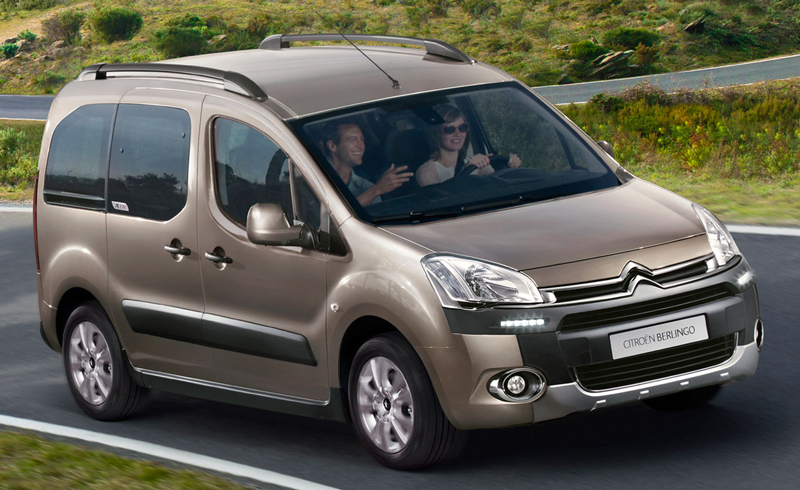 Let’s be clear about this: the Citroen Berlingo is not a luxurious car. But what it does offer passengers is plenty of space. Both headroom and legroom. Second row passengers also get full size individual seats so it is easy to get three children in child seats. External road noise is kept to a minimum and the suspension is supple. Air conditioning which is standard on a lot of cars now is an optional extra on the Berlingo. French cars don’t have the greatest reputation for reliability and Citroen has certainly had it’s problems in the past but so far the latest Berlingos have faired well and owners are not reporting any major issues with this car in the 2012 JD Power survey. You should find the running costs good on this car. Fuel economy is good on the 1.6 litre diesel engine and a CO2 g/km rating of 144 puts this car in tax band F costing £140 per year. Insurance should also be cheap with the Berlingo being in group 7. A hugely practical, spacious, value for money offering. Recent styling updates have made the Berlingo look less like a van and more like a sporty utility vehicle. It is a shame that seven seats are only offered on one variant and you can easily find yourself adding optional extras as some features that buyers have come to expect are not offered as standard. This is however a car to consider.